Here is another terrific chart from Shorty Rogers (as recorded on the "Portrait of Shorty" album). Bob Curnow has arranged one of Shorty Rogers' hippest tunes. 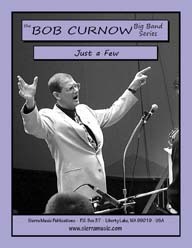 As recorded on Portrait of Shorty, (including the best of West Coast jazz musicians such as Herb Geller, Bill Holman, Jack Montrose, Frank Rosolino, Conrad Gozzo, Conte Candoli and others) this is a great, up-tempo, swinging chart with lots of solo space for alto and tenor saxophones, trumpet, trombone, bass and drums. As recorded on the BMG CD The Big Shorty Rogers Express, this is a wonderful West Coast chart which features optional clarinet with trumpet on the melody (as played by Jimmy Giuffre and Shorty) for a neat sound. 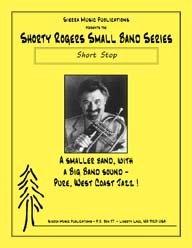 As recorded on Shorty's CD Blues Express, this is a wonderful West Coast chart which features unison saxophone son the melody, solo space for alto sax, trumpet, trombone and a short solo for bass. Shorty Rogers was very well known for his "nonet" charts (6 horns, 3 rhythm), and this was one of his best-loved compositions. This is a Nonet chart which was recorded on the Re-Entry album by Shorty Rogers and His Giants (Bill Watrous, Bill Perkins, Bob Cooper, Shelley Manne and others). As recorded on Portrait of Shorty, (including the best of West Coast jazz musicians such as Herb Geller, Bill Holman, Jack Montrose, Frank Rosolino, Conrad Gozzo, Conte Candoli and others) this isa medium tempo Swing chart that has a very unique, catchy sound to it. 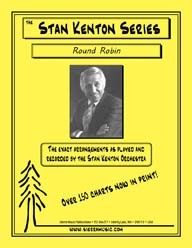 This amazing chart was recorded by the Stan Kenton Orchestra and released on the By Request-Volume One album. Boy are we proud to finally get a Shorty Rogers big band chart into print . This is a Nonet chart which was recorded on the Re-Entry album by Shorty Rogers and His Giants (Bill Watrous, Bill Perkins, Bob Cooper, Shelley Manne and others). 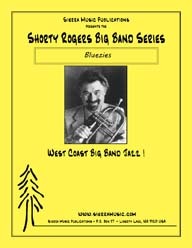 Here is a wonderful, easy, swinging chart which is on the CD Shorty Rogers Courts the Count, a terrific big band tribute to Count Basie.